Shepherds in train-ing at Rathwood. 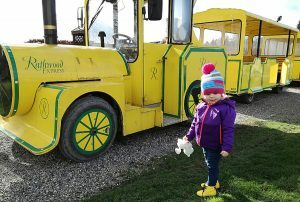 Thanks to the influence of her big cousin Scotty, Mimi has developed something of a passion for trains, most notably Thomas the Tank Engine. Combine that with her love of anything cuddly, owls, koalas, foxes, or sheep, and a trip to the Bo Peep train at Rathwood could not have been better timed. Though I knew we were booked in for a week in advance, I didn’t surprise Mimi with the train plans until the day before. And that was probably wise, seeing as she sang the Little Bo Peep song pretty much non-stop from that moment on! Even a Beastie Boys CD in the car (hence the title) couldn’t sway her from her rendition. I only had to suffer, and join in on, the tune for an hour’s journey though as Rathwood was easy to find, located just a short hop off the M9 and well signposted. On arrival there was a minor battle getting this toddler to walk past the assortment of wonderful, crafty toys and trinkets in Rathwood’s gift shop, but promises of a return finally got us into the train’s waiting area. Populated by every season’s decorations, a polar bear, a halloween tree, and a gingerbread couple, there was little risk of the kids getting bored and even a few photo ops. The experience starts with an enormous sheep, whose name we would learn to be Seamus, appearing through a door and running among the kids doling out high-fives before legging it out the other side. Mimi appeared suspicious of Seamus but grudgingly high-fived him too – she wouldn’t leave a sheep hanging. Bo Peep then arrives and requests the help of the boys and girls to track down Seamus and we were off to board the sheep-locating train. ALL ABOARD: Mimi does her technical examination of the Rathwood Train. Bo Peep kept the banter going as the train toodled though the gorgeous grounds of Rathwood. She pointed out the reindeer grazing and told a few punny jokes before being interrupted and interrogated by our Mimi who had a few technical questions to ask like ‘Where are the train’s tracks?’ and ‘Did you lose your sheep AGAIN?? !’ but Ms Peep was not to be flustered. 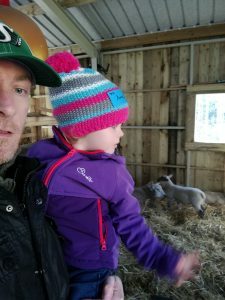 The first stop off on the hunt for Seamus was the barn, where we looked for clues and admired the real-life sheep and lambs in the pens. This bit could have been longer, in fact I reckon Mimi wanted to stay in the barn, most likely to try and smuggle a lamb out with her. But HOW did you lose them? Lambs! Give us one of them! Not to spoil the full 45-minute experience, suffice it to say that Seamus was indeed returned safe and well to his keeper. There were some moments of jeopardy when Freddie Fox appeared on the scene and it did seem like the only thing for Seamus now was a nice mint sauce, but tragedy was averted. At the train’s final stop Bo Peep handed out bread to feed the geese, which Mimi was kind enough to sample for them – you’d swear we never fed the child! Each kid on the train was given a sweet little cuddly lamb toy to take home, and Mimi’s has barely left her side since, possibly because she’s seen how easy it is to lose sheep. 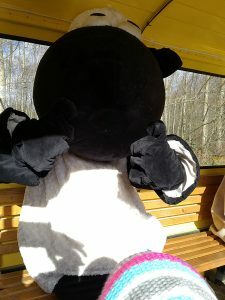 As the train pottered back through the woods, led in song by Freddie Fox, Seamus sat in our carriage and gladly doled out hugs to the besotted kids. Meanwhile, Bo Peep raced us back in a waiting golf cart, which is not a part of the nursery rhyme that I remember – but I suppose ‘golf cart’ has limited rhyming options..
After disembarking, all the kids took turns having their photos taken with the gracious cast, even the two tween boys who didn’t seem overly excited about it. My photo of Mimi (above) doesn’t show quite how much she enjoyed it (resting grump face), and prompted her mum to say it looked like a hostage scenario, but she really did have a great time. THUMBS UP: Seamus’s enormous head only just fit in the carriage. 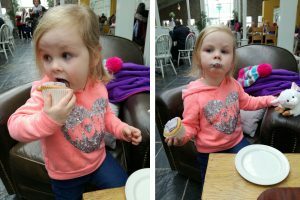 To top it all off, we snacked in Rathwood’s well-stocked cafe, Mimi enjoying her complimentary cupcake while I recaffeinated for the spin home. It’s a bit of a drive for a short-enough experience but I’d still say it was worth the trip, especially as my tuckered-out toddler slept all the way home, while I hummed ‘leave them alone and they’ll come hoooome..” to myself. CUPCAKE WITH A CUPCAKE: Mimi enjoying her complimentary snack. 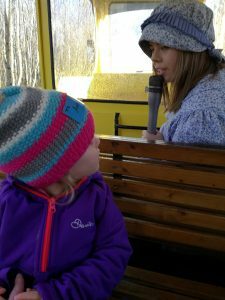 Amelia and I were given free passage on the Bo Peep train in exchange for an honest review. Next Post I swear to be a good parent.. FFS.